Councillor Leigh Wilson says RBS needs to "up its game". A Mearns councillor has called on Royal Bank of Scotland to “up its game” following concerns raised with their mobile banking provision in the area. 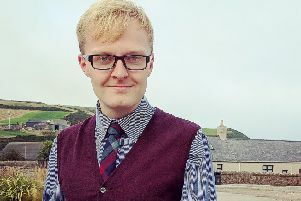 Leigh Wilson had met previously with RBS chiefs in Montrose to discuss the closure of the Angus branch, and assurances were given that a mobile van would be dispatched around the Mearns to compensate for the loss of service. As the route has taken shape, however, local residents have voiced concerns over the availability of the van. Mr Wilson said: “I have been contacted by numerous people regarding the mobile banking provision provided by RBS. My Mearns ward is quite rural but its also quite vast so there are already greater difficulties for people accessing it. “The times it visits my ward are restrictive to most people who are working, and the short duration of the stay is problematic for anyone who wants to do meaningful business. However, the ultimate insult is that the van doesn’t even have disabled access – it did initially but had to be removed because of safety concerns. Well, it shouldn’t be beyond a company like RBS to invest in equipment that can accommodate everyone. RBS took the decision in December to close 62 branches in Scotland, with Montrose one of the losses, citing a change in the way customers access services as the primary reason. The full extent of closures leaves RBS with half the number of branches as its main competitor, the Bank of Scotland. The loss of the Montrose branch – after recent closures in Brechin and Stonehaven - leaves a gap in provisision between Arbroath and Aberdeen and a 50-mile round-trip for some Mearns residents to access their nearest bank. The mobile bank only visits Mearns communities twice a week for a maximum of 45 minutes. Mr Wilson added: “I met with RBS bosses in Montrose earlier this year to discuss the Montrose branch and although they were intransigent in their decision to close it, they told me that there would still be a number of ways customers could access their services; the mobile branch being one. “I accepted them at their word but I’ve since had stories relayed to me of queues forming outside the van but at the departure time the shutters come down and the van takes off, leaving a trail of disappointed customers. A spokesman for RBS said the bank is responding to changes in the way its customers are conducting their business. He said: “Across Scotland, counter transactions reduced by 42 per cent between 2014 and 2017, only one per cent of our customers in Scotland visit their branch weekly; and seven in 10 customers are using mobile or online banking. “We recognise that change can be unsettling however our teams are committed to ensuring that all our customers receive the best possible service, if customers have concerns or questions about their options then we would encourage them to get in touch with us or speak to our local team. “We have invested to provide more ways to bank with us now than ever before from local, to face-to-face and digital options: branches; Post Offices; mobile vans; online banking; mobile banking; telephony; cash machines (ATMs); cashback; contactless; Community Bankers; Business Growth Enablers; TechXperts; and many more.